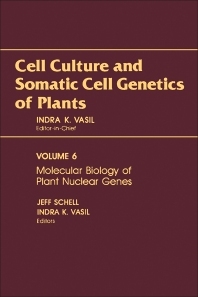 Cell Culture and Somatic Cell Genetics of Plants, Volume 6: Molecular Biology of Plant Nuclear Genes focuses on the spectacular and rapid advances in the molecular biology and genetics of plants. This book consists of 19 chapters. Chapters 1 to 5 describe the most commonly used approaches for the genetic transformation of plants. The light-inducible and tissue-organ-specific genes are discussed in Chapters 6 to 11. In Chapters 12 to 14, the genes regulating phytohormone synthesis, heat shock proteins, and nodulation in legume roots are treated, while in Chapters 15 to 16, the relationship between chromatin structure and gene expression and molecular biology of plant RNA viruses are analyzed. The development of transgenic plants resistant to viruses, insects, and herbicides is dealt with in the last three chapters. This volume is suitable for plant molecular biologist, genetic engineers, and researchers concerned with plant cell and tissue culture.